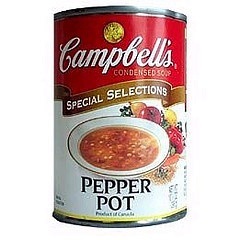 On the other side of the world, Campbell’s soup plays a quieter role. I found this lovely reuse of a can in an alleyway in Macau. Half filled with dry rice grains, the can holds incense sticks burnt as an offering to dead ancestors. The lazily drifting smoke serves as a bridge to connect the spirit world to the homes of faithful descendants. Perhaps someone’s grandmother loved creamy corn with chicken soup? Or perhaps the day-to-day tasks of honoring the dead has settled into the comfort of reusable containers? In my print studio are two drawers of old copper and zinc cuts, from the days when metal — not pixels — spread words and images around the world. Mixed in with farm manual illustrations, matchbook covers for defunct restaurants, and finely etched maps of roads crisscrossing San Jose’s orchards lay lots of product images for food adverts. 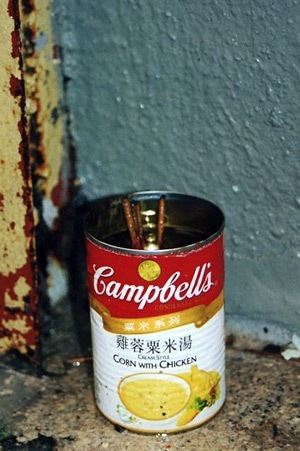 Campbell’s iconic soup can is one of my favorites. While my childhood memories involved many more bowls of chicken and stars than tomato, Andy Warhol’s conflicted critique of mass production still holds my attention. Even better, an actual can of pepper pot in my office reminds me of all the quirky, real-life, meaningful intersections between the distant past and the relevant present, our private stories and public memory. Perhaps soup is not so humble a food after all.